At the end of WWII, Dwight Eisenhower named five things that he considered to be part of the reason that the Allies were victorious. Surprisingly, most of them were not offensive weapons at all and one of them was the Jeep. WWII was a perfect example of the importance of supply and reconnaissance. If you have them, then you will be able to carry on the fight. Often times an army outran its supply line and what was a sterling rout of the enemy, turned into a defensive battle while awaiting more supplies. Anyway, the Jeep is as synonymous with Americans in WWII and Korea as anything else. Though the actual vehicles used for what was the jeep's original mission have changed, the concept is basically the same. A relatively small four wheel drive vehicle for transporting men and priority supplies as well as being used for light recce. Its ability to travel and relatively high speeds on prepared surfaces and yet go off road with little problem made the Jeep the icon of the war that it became. This is the first kit in this scale from Fine Molds. Now I know that 1/20 is not a 'standard' military vehicle scale, but there are a number of other model types in this scale and if one wants a relatively large model of a relatively small vehicle, then 1/20 seems as good as any other. It is probably the only scale in which a Jeep.....excuse me....1/4 ton 4x4 truck has not yet been molded. 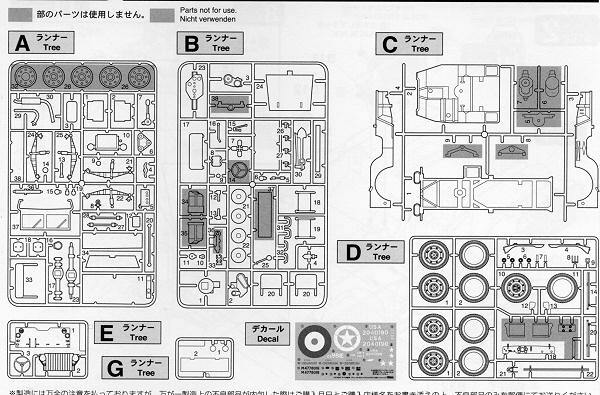 The kit is provided in six sprues, one of which is clear for the windscreen and light lenses. Surprisingly, there are parts not used so this bodes well for other versions. This is an early version of this vehicle, basically one step past the original Bantam. What that means is that it has the thin, slat grille. Later versions had a grille of what I believe was stamped steel in one piece. This makes this a rather unique kit in that respect. Much of the rest of the vehicle is like those that followed and even the early ones were used well after the end of the war. You'd expect a 1/20 kit to be well detailed and this one is. It has a complete engine and interior. The hood can be opened and the windscreen just snaps in place so you can fold it down should you wish. A well detailed suspension and exhaust is also in the kit. Tires roll and you can pose the front wheels as these ar e designed to turn. About the only thing the modeler may want to do extra is to wire the engine, which should be simple as it is only four cylinders and of a good size. I should also point out that there are instrument decals to put into the instrument panel. Instructions are superbly done with the usual Gunze paint references. Those thinking the box art looks like a photo would be correct as it is. This and many other full color photos are included in a booklet that details the various parts of this vehicle. The restored Jeep is superbly done and I'm sure many will find the photographs quite helpful when it comes to adding any extra detail and determining colors. Markings are included for three vehicles. 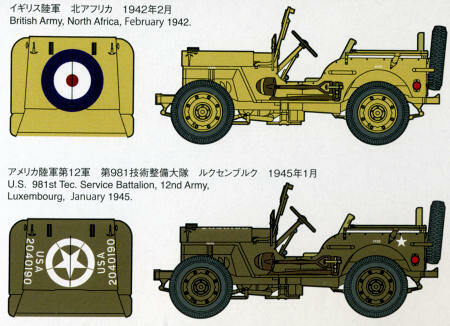 Two are shown here as a British Jeep from North Africa in 1942, and a US version based in Luxembourg during January 1945. The third option is the box art vehicle from New Guinea in 1943. This one has no star on the hood and the serial is in blue, but otherwise just like the previous option. Aside from Pat Brady's 'Nelly Belle' (some of you will know what I mean), Jeeps were not very colorful. Overall, this really is an excellent kit. Some may wonder why another Jeep in another scale while others will embrace this as one of the nicest Jeep kits ever done. Thanks to www.dragonmodelsusa.com for the preview kit. If your local shop does not have it, have them order it for you.